For the first time since Raf Simons took over the design duties at Christian Dior, the brand has hired black models for its runway show. Six black models were cast in today's Dior couture show, one of the most highly anticipated fashion shows of the season. Dior couture walked this morning in Paris, and photos and early reviews are just trickling in. ShowStudio has photos of the full collection and a panel discussion about the show. What is immediately interesting about the 50-look show is its casting: the show found room for the Latina models Simone Carvalho, Marina Nery, and Teresa Lourenço, and the Asian models Yumi Lambert, Chiharu Okunugi, Ji Hye Park, Meng Huang, Ming Xi, Sung Hee, and Fei Fei Sun. 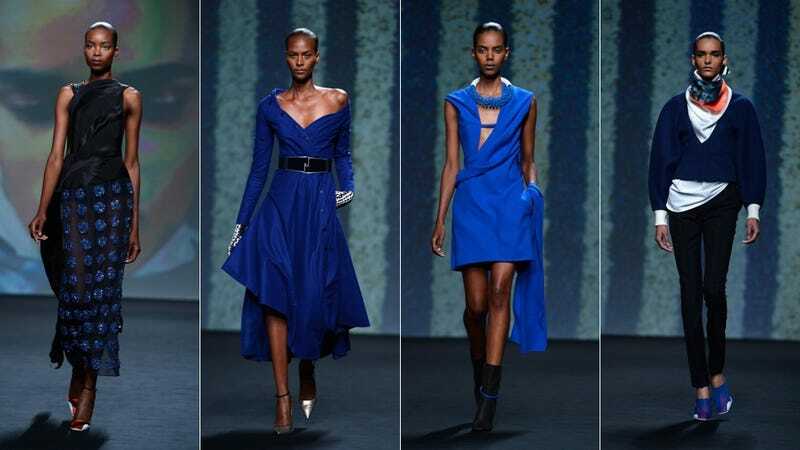 Perhaps most significantly, the black models Alek Wek, Grace Mahary, Joan Smalls, Maria Borges, Kelly Moreira, and Yasmin Warsame all walked. They are the first black models to ever work for Simons at Dior: in the previous six collections he has overseen, no black models have been included in any show cast, lookbook, or seasonal ad campaign, according to Fashionista. The whitewashing of the Dior brand under Simons' watch was particularly significant because, under former creative director John Galliano, Dior shows and ads were very racially diverse (by the standards of high fashion, at least). Galliano's personal issues with race are well-documented — he was convicted, under France's strict hate speech laws, of hurling racist and anti-Semitic abuse at a couple of strangers in 2010 — but as a designer, his vision was rooted in a multi-cultural world. When Simons abruptly switched to virtually all-white casts, people noticed. Earlier this year, prominent casting director James Scully even called Simons' casting racist. I couldn't find them afterwards in the 800-strong crowd to ask what they thought ofSimons's interpretation of kimonos, obi belts and the shibori binding and drying techniques he used to produce a spiky fabric which looked like the surface of a rubber massage ball. Perhaps they preferred the European section — Parisian New Look dresses, with multi stranded pearl necklaces and laminated houndstooth suits, or the American element which fused sportswear and the stars and stripes (mainly the stripes) into pimped up pencil skirts composed of patent and sheer bands. British Vogue's Jessica Bumpus wrote, "This was Dior as seen through the filter of an African tribesman or a Geisha girls." Yikes. Let's hope that's just one fashion critic's off-base interpretation; fashion certainly needs more models of color in positions of visibility, but perhaps even more than that, fashion needs ways of seeing them that aren't hackneyed, otherizing, Western-created tropes like "Geisha girl" or "African tribesman."